In an effort to promote the 4P's of "Prepared" students, students must ensure that they bring all of their necessary items to school before the day begins. 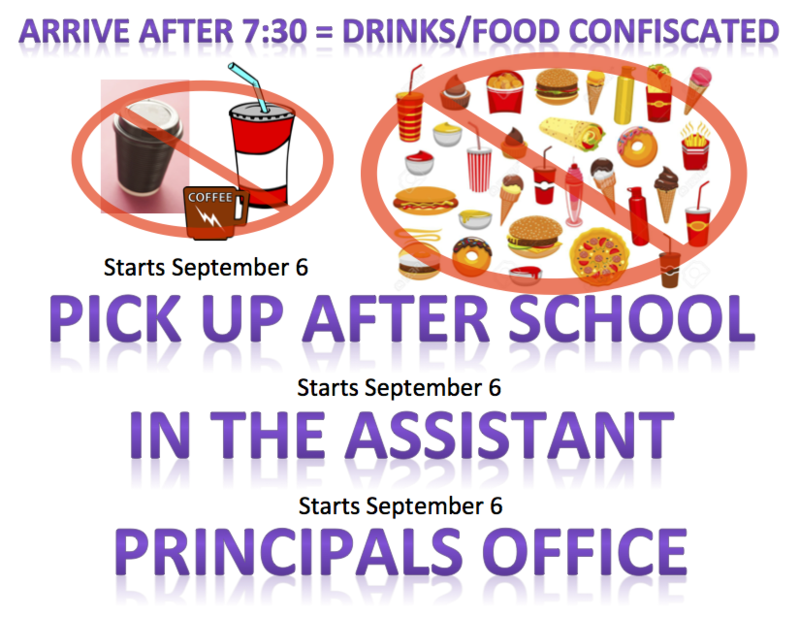 Therefore, we will not be accepting items to be dropped off or delivered to students during the school day. As well, we want to eliminate the risk of having items being delivered to the wrong student, lost or stolen and ensure that students are in class and not being disrupted during instructional time. This includes outside food and beverages. Any student who must have a specific food item delivered for medical needs must have the proper documentation filed with the nurse's office in order to provide an accommodation for the student. All items would need to be delivered after the lunch bell in order to not disrupt classroom activities. Thank you for your support with this matter! Per LAUSD BUL-5468.0 titled Use of Cellular Telephones and Other Electronic Devices by Students: Students are permitted to carry cell phones provided they remain “off” and stored in a non-visible place (backpack, purse, pocket) during normal school hours. The use of cell phones or any electronic signaling device is prohibited during school hours. Cell phone cameras are not to be used. Cell phones that are seen, heard or turned on during school hours may be confiscated and returned only to a parent/guardian on Wednesday after school in the Main Office. The school is not responsible for lost, stolen, or damaged cell phones. Bicycles and skateboards must be walked on campus and be locked in the bike/skateboard storage area before school begins. Bike racks are located in the West Quad and skateboard racks are located in the East Quad. Students must provide their own locks. The school does not assume financial responsibility for loss or damage to personal property including bicycles and skateboards. Any skateboard or bike that is not locked up in the proper location will be confiscated and returned to parent/guardian the following Wednesday. should not be brought to school since loss, theft, or damage is possible. Also, such items can be distracting to the educational process and may be confiscated by school personnel. Graffiti on backpacks, books, notebooks and other personal items is not permitted and may also be confiscated. The sales of food and drink items by students is not permitted and is in conflict with the LAUSD Policy on fundraising, see Bulletin-1633 titled POLICIES GOVERNING SCHOOL FUND- RAISING ACTIVITIES OF PTA, APPROVED PARENT GROUP/PTO, AND BOOSTER CLUBS. Any items being sold by students will be confiscated and returned to parent/guardian on the following Wednesday. At no time should items be delivered to students through side gates for any reason. This includes food, athletic equipment, money, homework, text books or any other items. The safety and security of the campus is of the upmost concern and to ensure this security we ask that no items be given to student in such a manner.